FireChat introduces a new way to chat: “off-the-grid”. Instead of relying on a central server, it is based on peer-to-peer “mesh networking” and connects to nearby phones using Bluetooth and WiFi, with connectivity increasing as more people use it in an area. It became very popular in Hong Kong. On 28 September 2014 afternoon in Hong Kong (around 11 PM PT on Saturday), Open Garden started seeing a lot more FireChat activity in the region. Over 100,000 people downloaded it in 24 hours in Hong Kong over the weekend, with the CEO saying that numbers are “booming” and up to 33,000 people were using the app at the same time. In Hong Kong, students and their supporters are protesting China’s refusal to back democratic elections for the territory as it promised when it took over Hong Kong from the British in 1997. China has a dismal track record when it comes to censorship, so an app like FireChat is an ideal protest tool, keeping people connected even when the government shuts down the communications infrastructure. Use of apps like FireChat shows how HK demonstrators are using tech tactics and are prepared for network shutdowns. It’s also been used by Iraqis and Taiwanese students during their anti-Beijing Sunflower Movement. 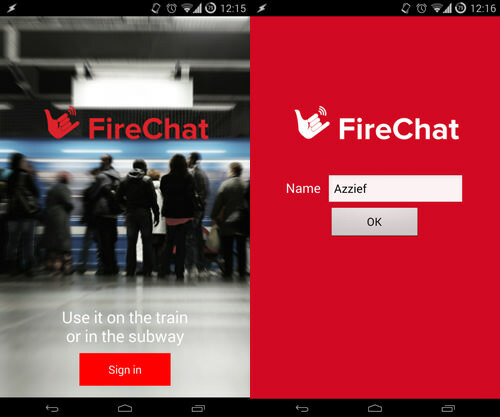 You can download FireChat for Android here and for iOS here. Due to our mission to uphold the right to privacy, which is guaranteed by the Universal Declaration of Human Rights, Privatoria recommends FireChat as an alternative to communicate without a cell network. As an indispensable tool when the government blocks any Internet resources are Anonymous Proxy and Secure VPN. VPN has made them the utmost priority to maximize your privacy and data security. You can unblock websites which are not available in your region. We will hide your IP address and location by giving you our own IP address. Surf securely without footprints and with your online privacy being untouched. No technical expertise is required to connect to Secure VPN or Proxy. All you have to do is to enter your anonymous and unique login and password that have been generated on your request. VPN can see neither your geographical location nor any browsing details which gives you more confident browsing experience. How To Avoid NSA Tracking?